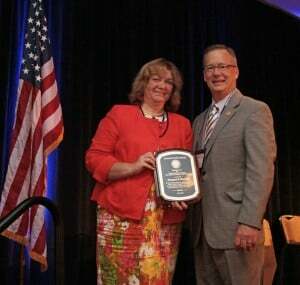 Margaret Harding receiving the American Nuclear Society (ANS) Special Award for excellence in media and communications at ANS’ annual meeting in Chicago June 26, 2012. In making the announcement, Loewen said, “This award symbolizes Margaret’s dedication, both behind and in front of the television cameras, to combating FUD—Fear, Uncertainty, and Doubt. We in the nuclear science community all thank her for her leadership and for shining the light of science during the dark days of misinformation following Fukushima.” An interview with Margaret is available here. As the aftermath of the Fukushima earthquake and tsunami has unfolded, Margaret Harding, founder of 4 Factor Consulting,was called upon by NBC, FOX News, CNN, the New York Times, and many others to explain and help bring clarity to the situation. 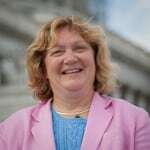 Margaret Harding has 30 years of experience in the nuclear industry – she spent many of those years at GE Nuclear Energy, departing as Vice President – Engineering Quality. She’s now a consultant to the nuclear power industry where she advises clients on a wide variety of opportunities and issues, including design and licensing, economic evaluations, impacts of Fukushima, and quality programs.